Nintendo can make anything into a game, even shopping for groceries. Nintendo has applied for a patent that shows it has huge plans for the Nintendo DS. Glasses-free 3D? Who needs it. Nintendo wants the DS to someday be able to... get ready... become a shopping assistant! It actually doesn't sound like that bad of an idea. The patent is for an "in-store wireless shopping network using handheld devices," with details that indicate such a network would use the Nintendo DS or DSi. When the systems are brought into a store, or given to customers, they would connect to the network and run a unique program. 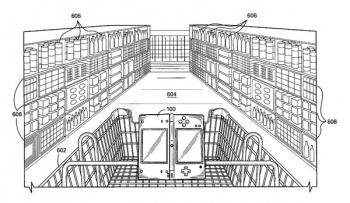 The Nintendo handhelds could potentially be attached to a shopping cart, where they would use a database to relay product information, create a shopping list, and to guide shoppers right to what they're looking for. The DS might display a map of a store's aisles, flesh out the ingredients for a specific meal, give cost or health information, or even recommend alternate products if one chosen wasn't available. It wouldn't be so bad if it could be used to play games too while someone you're with is shopping for uninteresting things. How many times have you been in a store looking for one simple item, with no employees around, and it just eludes your grasp at every turn? I know it happened to me three times in the past month while I was looking for peanut butter, Old Bay seasoning, and steel wool. With the help of Nintendo, maybe it won't have to happen to any of us again in the future, but this better not mean my Nintendo 3DS will someday get filled up with ads for Corn Flakes.